The Red Bridge is a former covered railway bridge that was reclad in 2008. It is a wonderful place to sunbathe, swim, launch your canoe or craft down the Similkameen River. Built by the Victoria, Vancouver and Eastern Railroad in 1907, the railway bridge first saw service during the area’s gold mining era. The covered bridge which spans the Similkameen River is a reminder of that bygone time when the V.V.& E. Railway ran up the valley. The line has been abandoned for decades. 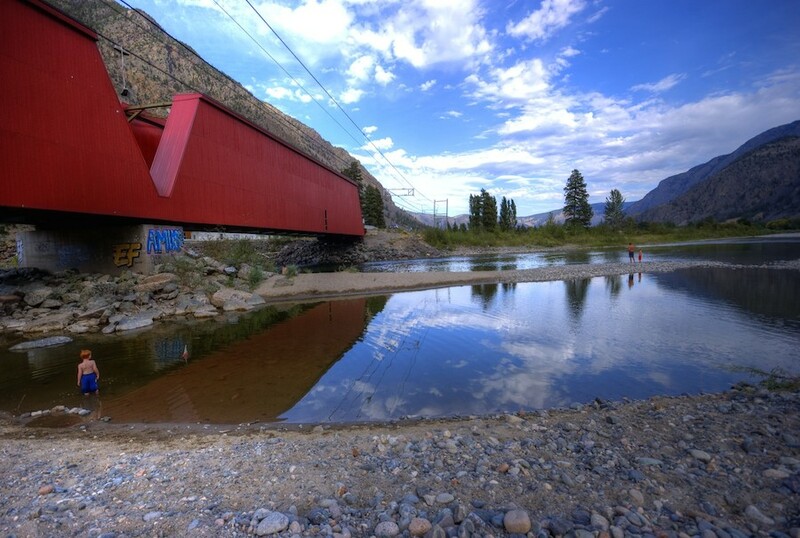 This bridge is the last of three such structures in the lower Similkameen Valley. Today this covered bridge is used as a highway bridge to the south side of the Similkameen River, to the Ashnola and Cathedral Lakes.